OT: Fish are (photogenic) friends, not food. I've been so mired up in scrambling for a big deadline in my day job this past week that my head is quite literally spinning, and I haven't given a single thought to food at all. But, now that we finally have a draft of our submission, I can at last take some time to blog about the wedding that I did way back at the beginning of July! The wedding was so much fun--so much so that I didn't actually get any pictures of it, save the cake! It was a morning wedding, and M. had sewn all of these beautiful picnic blankets so that everyone could picnic on the grass under the sun for brunch. 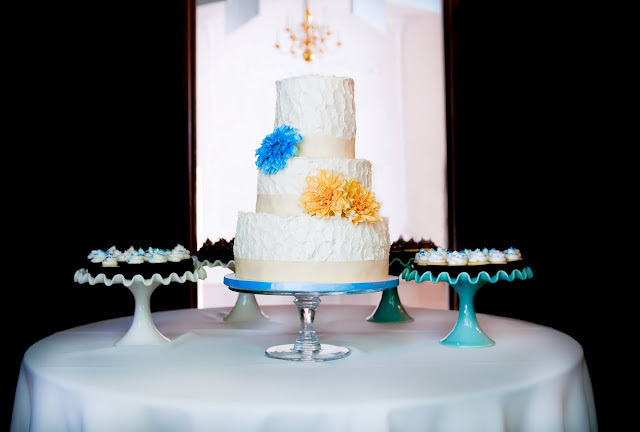 For the cake, I wanted to reflect the California rustic theme of the wedding, with the baby blues, golden yellows, and creams. M. and S. knew that they absolutely did not want fondant (I concur! 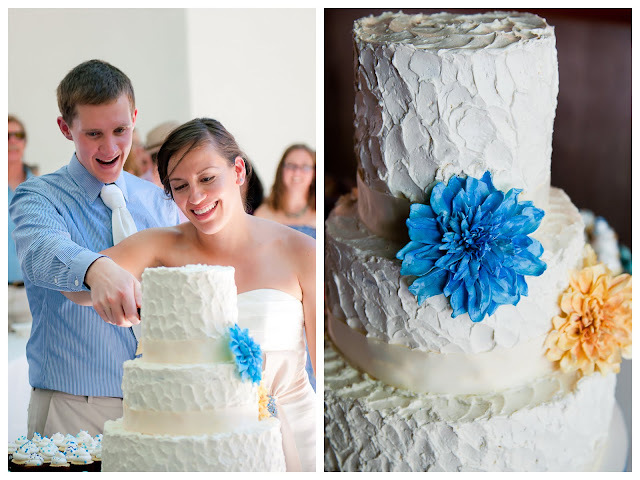 ), so I went with a rustic buttercream exterior, which complimented the laid-back summertime feel of the wedding. 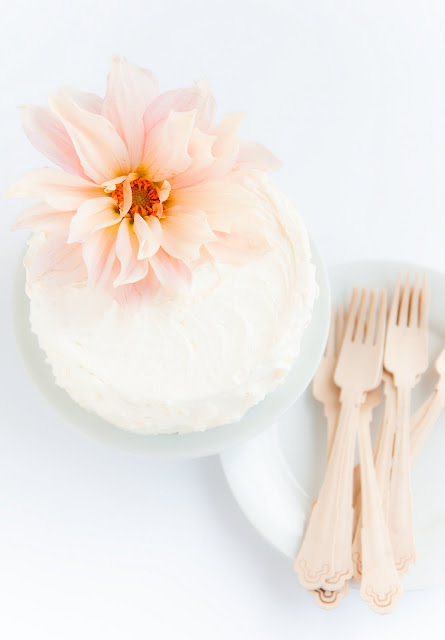 Then, I made three dahlia sugar flowers because all of the flowers at the wedding were to be in-season, organic, California-grown flowers, and dahlias were indeed in season! Finally, the cream ribbon wrapping the cake was a bit of inspiration from M.'s wedding dress, which was super cute, with a cream sash around the waist, held by a bright, baby-blue brooch. As for the flavor of the cake, M. and S. presented me with a bit of a challenge that took me a while of deep thinking to solve. They wanted chocolate--lots of rich, dark chocolate. And mint. Nothing else--no fruit, just chocolate and mint. Finally, I decided on a black cocoa chocolate cake--as dark as you can get--flavored with Bailey's liqueur and layered with fresh mint-infused dark chocolate ganache and vanilla Italian meringue buttercream. The fresh mint and dark chocolate went together beautifully and worked wonders for a hot summertime day! I'm so glad I went with the fresh (home-grown, may I add) mint instead of peppermint! 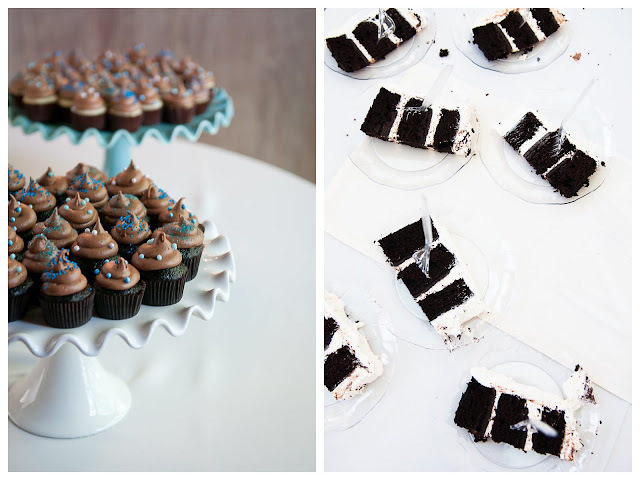 The cupcake flavors were much simpler: chocolate and vanilla cake bases, with chocolate-cream cheese frosting and vanilla buttercream. One final congratulations to M. and S. for their marriage! Thank you so much for letting me make your cake and be a part of your special day! Oh Steph, that's fantastic. The sugar flowers! The flavours! Oh my. You're such an inspiration. Gorgeous! I'm glad you had some time to post about it :D The flowers you made are so pretty! Thank you so much, all! 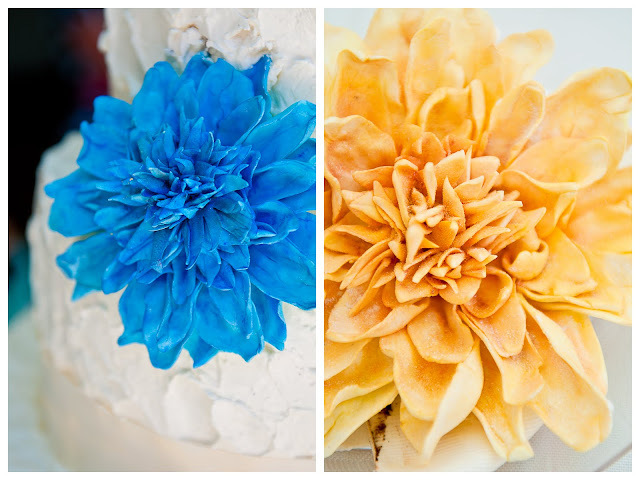 The sugar flowers were so much fun to make and definitely my favorite sugar flowers to date. That's amazing - what a beautiful cake. Congratulations! Wow this all looks great, Steph. Great job and congrats to your friends :). Absolutely gorgeous. I met my boyfriend at University of Delaware (another blue & gold) so this could totally be a UD cake as well! love that idea. And the flowers are amazing! I would loveee a post explaining how to do those!